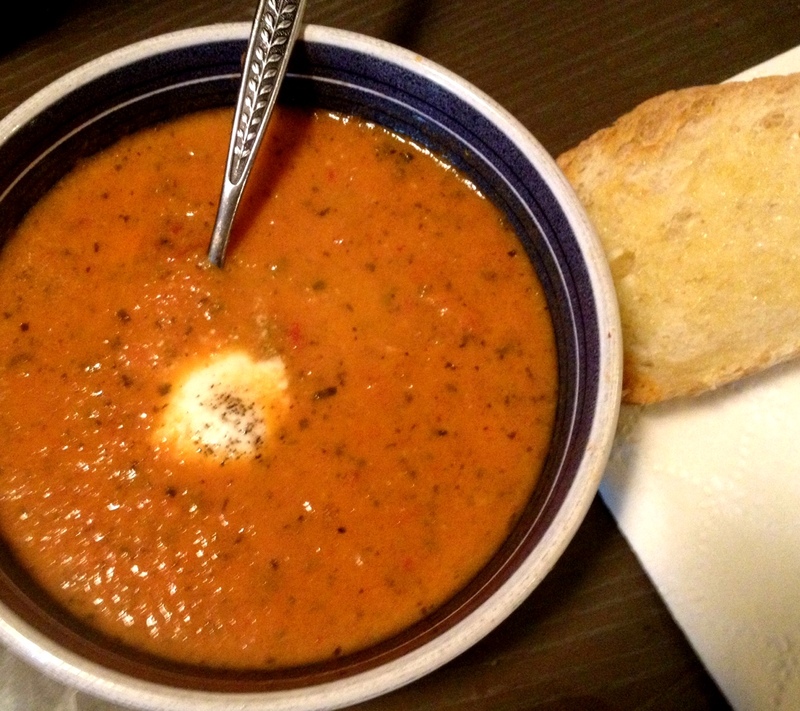 Homemade tomato basil soup, with a dollop of ricotta and some sourdough to dip. 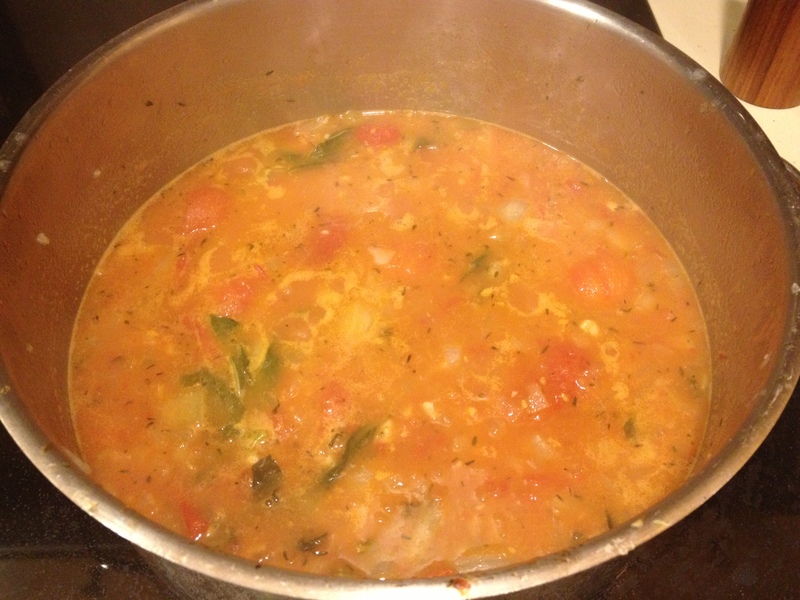 Fresh & Natural ingredients simmer together to make this soup. It’s a question, after some un-publishably bad recipes, I wish I was asking myself more often. I recently had some high hopes for a vegan pumpkin bread, but it didn’t hold a candle next to my mom’s buttery non-vegan bread. Another disappointment was a favorable biscuit recipe on Pinterest that everyone seems to love, but I found I was trying to convince myself they were sooo good I wanted to go back for more. Once the roasted tomatoes are added, it starts looking more like a soup instead of a chunky stew…And your house will start to smell really good. Anyways, bombed-recipes tangent aside, I’m glad I’ve redeemed myself with this classic! Ina never fails. I love her. I am so excited to never buy canned tomato soup again. I’m already dreaming about how good this is going to taste tomorrow at lunch. Cause you know, most soups are always better the next day. 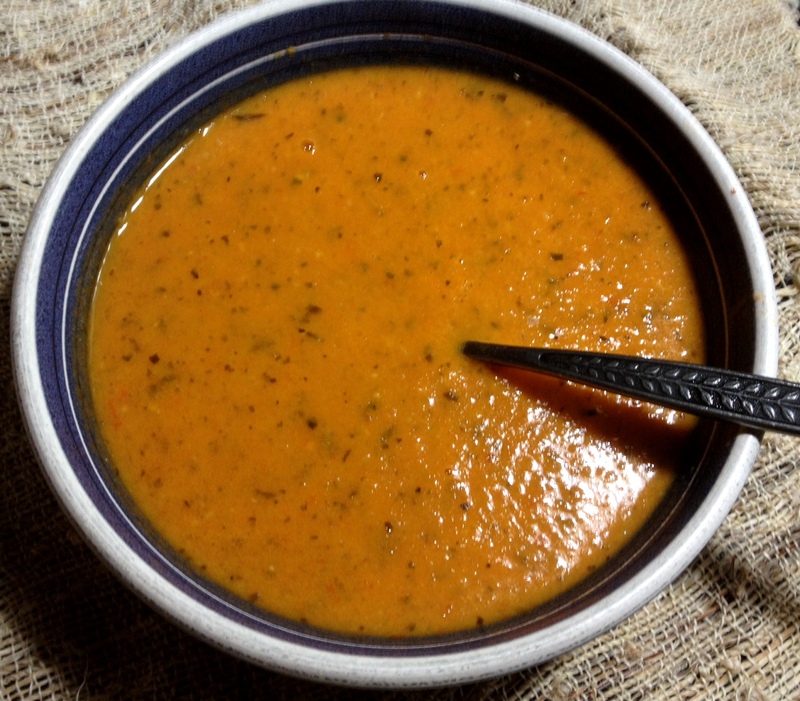 Use an immersion blender to puree the soup to your desired thickness. Ina uses a food mill to make a very chunky soup, but I don’t own one. This option still worked wonders. Preheat the oven to 400 degrees F. Toss together the tomatoes, 1/4 cup olive oil, salt, and pepper. Spread the tomatoes in 1 layer on a baking sheet and roast for 45 minutes. In an 8-quart stockpot over medium heat, saute the onions and garlic with 2 tablespoons of olive oil, the butter, and red pepper flakes for 10 minutes, until the onions start to brown. 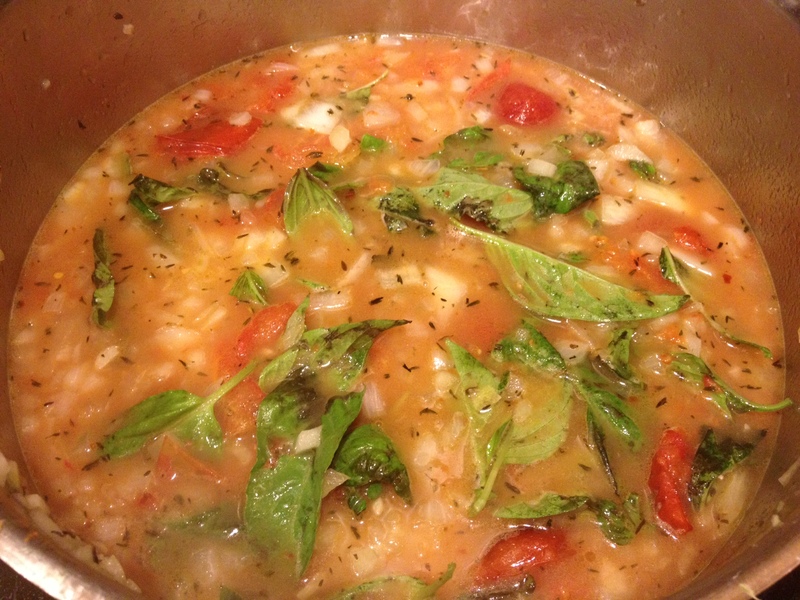 Add the canned tomatoes, basil, thyme, and chicken stock. Add the oven-roasted tomatoes, including the liquid on the baking sheet. Bring to a boil and simmer uncovered for 40 minutes. 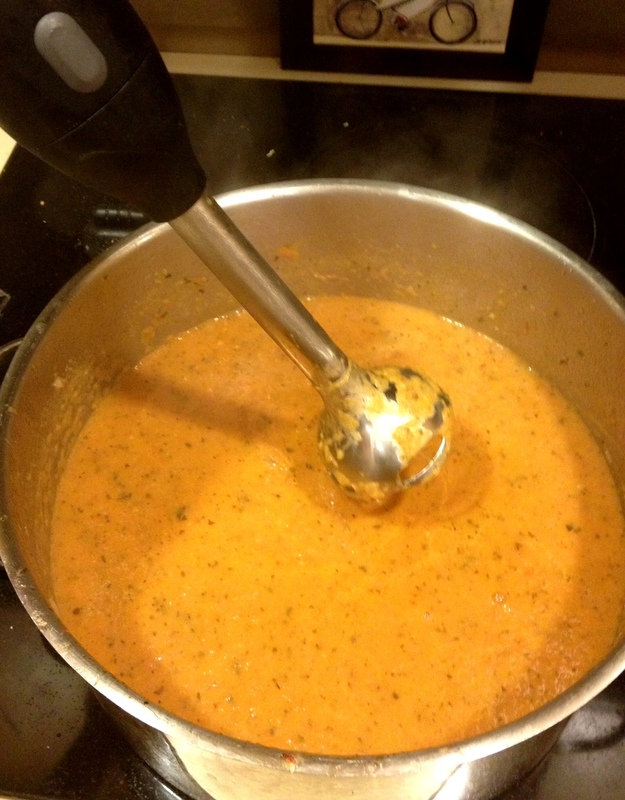 Use a hand/immersion blender to lightly puree the soup. Make sure the immersion blender is at least an inch deep and close to the bottom of the pot – you don’t want soup exploding everywhere! Taste for seasonings. Serve hot or cold with grated parmesan, a dollop of ricotta, or crusty bread. Just about anything tastes good paired with this soup!